Important Thurston Document & Jane Thurston's Own Webster's Common School Dictionary That She Used In School When She Was Very Young. February 2007 CLICK HERE To Learn About Thurston's 2 Billboards For The "East Indian Mysteries". CLICK HERE To Learn About The Print Block And Photo For The Image Shown In The January 1934 Issue Of Sphinx. April 2007 Ever Wonder Where The Idea Came From For The Famous Thurston Strobridge 1907 Turban Full Length Portrait Lithograph? May 2007 CLICK HERE To Learn About The 2 Earliest Known Howard Thurston Posters To Exist! Both Posters Are From 1905 And Come From The Famous David Price Collection! July 2007 CLICK HERE To Find Out About These 2 Giant Sized Thurston Heads! These Were Used In Thurston Theaters! Check Them Out! August 2007 CLICK HERE To Find Out About This Howard Thurston Window Card, "Do Spirits Return?". It Is Extremely Rare Piece And This Exact Piece Just Appeared In A New Thurston Book! September 2007 "An Open Letter To I.M.C. 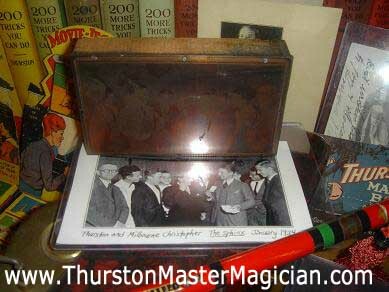 Readers"
CLICK HERE To See Thurston's Response To Someone Saying Thurston Was Revealing Magic Tricks To The Public. An Extremely Rare Cabinet Photo Of Bella Hassan, Noted Juggler With The Kellar And Thurston Show. CLICK HERE To Read More About This Great Juggler! November 2007 Before Howard Thurston was known as "The World's Greatest Magician", that title went to Harry Kellar! CLICK HERE to find out more about this postcard written by a fan of Harry Kellar! Including 4 actual FRONT ROW tickets to see the Thurston show in 1923!